Monitoring rooftop PV systems and whole-of-home electricity consumption in real-time is standard fare for Wattwatchers, and across Australia the nation already has over 2 million solar-powered households. But ground-source heat pumps, also known as renewable thermal heat pumps, are a far less common proposition in the ever-expanding world of distributed energy resources (DERs). So, when an opportunity arose to join a ground-breaking project to track and analyse the performance of residential heating and cooling systems that bring geothermal energy into suburbia, our team jumped right in. At stake is the potential to displace conventional air-sourced air-conditioning systems, with major electricity savings. When combined with energy efficiency, solar PV and digital energy solutions, geothermal at household-level could be another big step towards the bold but achievable dream of net-zero energy homes. That’s led to Wattwatchers becoming a technology partner in Fairwater Living Lab, a 3-year collaboration brought together by Climate-KIC Australia, with grant funding support from the Australian Renewable Energy Agency (ARENA), and hosted by leading development group Frasers Property. ARENA formally announced its $500,000 in grant support for the $1.7 million project today (on ARENA website here and PDF here). The wider project collaboration also includes the NSW Office of Environment and Heritage, University of Technology Sydney (UTS), Curtin University in Western Australia, and the Green Building Council of Australia (GBCA), with additional partners likely to join. 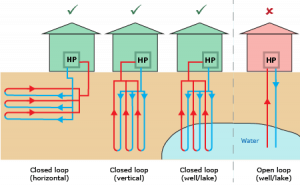 What is a ground-source heat pump anyway? The two vertically-drilled examples in the middle are indicative of the style of ground-source heat pump being deployed. The good news is that ground-source heat pumps are a form of renewable energy that could become more widely used in households in Australia, and internationally. Thanks to Frasers’ foresight, they are being pioneered at commercial scale at its major new residential community, Fairwater, located in the Blacktown area of Western Sydney. At Fairwater – where 200 of a planned 800 residences have already been built, sold and occupied – each new home comes with a renewable thermal heat pump system that requires drill-holes and piping to be installed deep under the ground (approx. 80-100 meters). You can read more about Fairwater – the first 6-Green Star Communities-rated residential development in NSW, which includes the largest geothermal residential installation in the southern hemisphere – and the technology and design principles behind it here, here and here. Under the project plan, about 40 of these households will be wired up with Wattwatchers devices for real-time energy monitoring, plus environmental sensors tracking temperature and air quality, to help build a detailed picture of how these geothermal-enabled homes ‘perform’ across four key areas: sustainability, resilience, wellbeing and commerciality. The extensive research component of the project, being co-delivered by UTS and Curtin University, extends across both technical and behavioural dimensions: covering everything from exploring actual performance against design expectations, through to marketing the benefits; and from householder individual experiences and responses, to community impacts such as reducing the ‘heat island effect’; to lower demand on energy networks and thus reduced developer costs for essential services. While grounded in commercial practice, it’s happening in a genuine community with home owners and tenants directly involved (i.e. a ‘living lab’), and the project outputs will be backed up with publishable peer-reviewed academic rigour via UTS and Curtain; and supported by the involvement of the property industry’s peak green body, the GBCA. Wattwatchers is a founding small business sponsor of the Australian Climate Knowledge and Innovation Community (Climate-KIC Australia), which launched in 2017 – based on a highly successful pan-European model, the original EIT Climate-KIC, which began in 2o10. Like its European sister organisation, Climate-KIC Australia offers a new way to link research, business, entrepreneurs, investors and government to facilitate systemic change. Through addressing the challenges and harnessing the opportunities of climate change, Climate-KIC Australia acts as a catalyst; linking ideas, commercial know-how and investment capital. 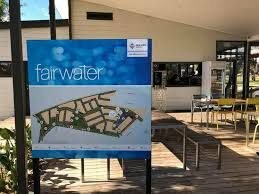 By example, as one of its first major initiatives, Climate-KIC Australia is the instigator and project manager of the Fairwater Living Lab project. Wattwatchers CEO Gavin Dietz says the highly-innovative Fairwater Living Lab project demonstrates the value of the Climate-KIC model, with its emphasis on collaboration. ‘It is all too easy to underestimate the incredible amount of vision, perseverance and sheer hard work that is required to bring a project like this together,’ says Dietz. 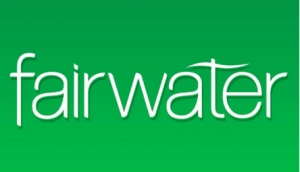 ‘It underlines why Wattwatchers is involved in Climate-KIC as a sponsor, and now in Fairwater Living Lab as an active partner and technology provider. Climate-KIC CEO Chris Lee says the value of the knowledge to be gained and shared from the Fairwater Living Lab project will be significant. ‘Climate-KIC Australia anticipates that the project will be able to build the business case for industry-wide deployment of renewable thermal energy heat pumps to replace conventional air-sourced air conditioning units,’ says Lee. The support case for the project compiled by Climate-KIC Australia and its partners addresses both the barriers to wider uptake of renewable thermal heat pump technology, and the likely benefits if these are overcome. Currently renewable thermal energy technologies are rarely used in residential buildings due to capital cost and lack of industry experience. Developers and home buyers alike tend to focus on the upfront cost of properties, rather than the whole-of-life costs of operating and maintaining them. But the potential for wide-spread deployment of ground-source heat pumps across the residential development sector is an alluring one, especially when used in combination with energy efficiency and other on-site renewables, especially solar PV, backed by cutting edge data and digital energy technologies. Initial modelling has indicated that with the inclusion of ground-source heat pumps, and a package of energy efficiency measures in every home, the overall energy demand of the development should be reduced by over 50%, from around 6GWh to <2.5GWh annually (with a proportion of this gain being provided by on-site renewables).